The Alignsat 1.2m Vehicle mounted antenna system is developed specifically tailored for light vehicle models. The system could be used for news gathering, emergence communication, importance events communication. 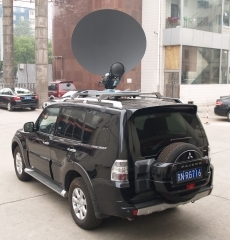 The Alignsat 1.2m Vehicle mounted antenna system is developed specifically tailored for light vehicle models. 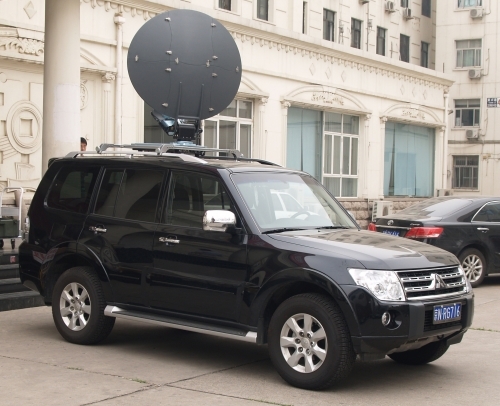 The system could be used for news gathering, emergence communication, importance events communication. The antenna system come equipped with remarkable advantages such as smaller size, lighter weight, higher reliability, and also very to use. The mechanical part of the vehicle antenna system adopts the advanced drive system that is introduced from Germany, which not only assures the stability, reliability and flexibility in an effective manner, but also reduces the weight of the antenna system significantly. The control system adopts advanced single chip micro controlling technology, which enables the strong adaptability and user-friendly interface. You could get acquainted with the system easily. Apart from this, our system is also loaded with manual controlling mechanism, which is independent from the auto controller. By switching between two modes accordingly, the effectiveness, flexibility and usability is tremendously improved, which adequately demonstrate what is necessary for an emergency communication device. The systems is loaded with integrated GPS systems and receiver, E-compass, incline-meter. All these features necessities the need for an automatic examination of antenna Azimuth, Elevation ,pitch roll angle, local longitude and latitude, therefore features the antenna with accurate positioning ability.